Is the Media Falling Short on Vetting Muni Candidates here on the Coast? We have much more coming on Larry, who was last seen with his foot in his mouth. Regarding then Moss Point Mayoral Candidate Mario King this is what I found. Author Douglas HandshoePosted on November 2, 2017 November 2, 2017 Categories SopTags 2017 Mississippi Municipal Elections, In Flagrante Delicto, Moss Point Mayor Mario KingLeave a comment on Is the Media Falling Short on Vetting Muni Candidates here on the Coast? It’s Over – Thank Goodness….. But the ramifications of last night’s voting are just beginning. Before I get to that though I’ll mention that as we covered the Singing River Pension meltdown, it became very clear from talking with the locals in Ocean Springs that the Connie Moran show had worn out its welcome in Ocean Springs thus last night’s election results there does not surprise. The Johnny DuPree show also wore out its welcome in Hattiesburg – Slabbed has some good Pine Belt area political contacts but we’ve not been following Hub City politics closely beyond the financial meltdown at the Municipal School District, which voters evidently blamed (correctly I’ll add) on DuPree, who was trounced by Toby Barker. The circus that was the Plukey Bolton trial also couldn’t helped DuPree’s public image. Neither did Martaze Hammond. 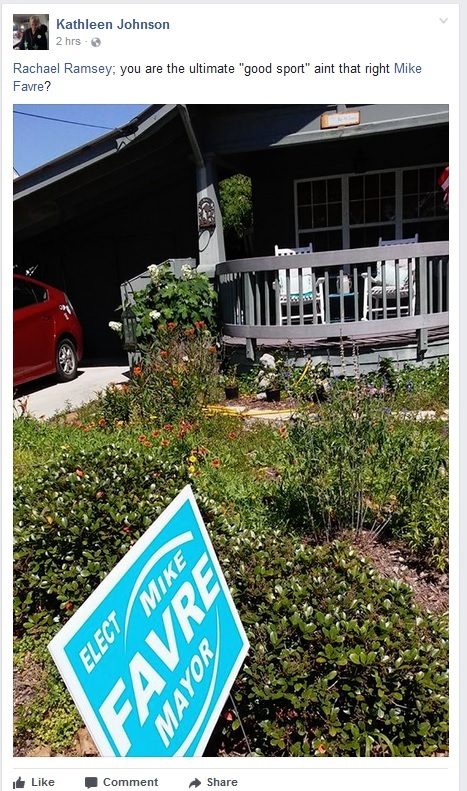 Content with the situation, Harding even held a Favre campaign sign while riding a unicycle down city streets before the polls closed on Tuesday. 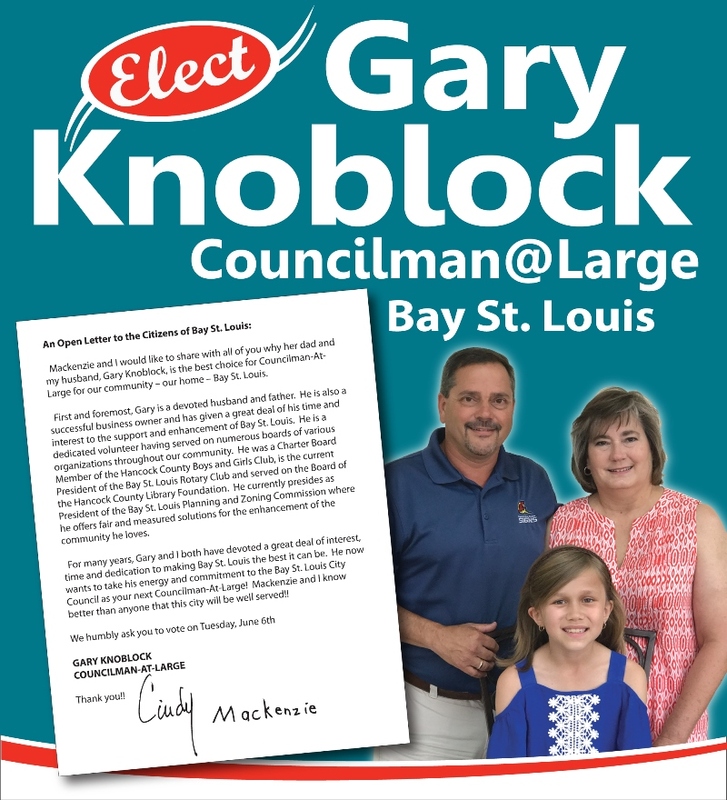 Author Douglas HandshoePosted on June 7, 2017 Categories SopTags 2017 Mississippi Municipal Elections, Bay St Louis City Council15 Comments on It’s Over – Thank Goodness…..
Monday a week ago the Hancock County GOP held a meeting at the home of a local member. The meeting was very well attended and it’s aftermath immediately caused a stir locally and by 8AM on Tuesday the 23rd Slabbed had already received the first reports of this extraordinary gathering and by close of business Wednesday Slabbed had heard directly from a couple of local GOP party members that were in attendance. Comments alluding to it were left on this website, culminating in this post from last week. The episode shows how the hacker’s activities extended to exposing Democrats’ get-out-the vote strategies in swing states and informing a Trump ally of hacked data during the national campaign. DCCC documents sent to Mr. Nevins analyzed specific Florida districts, showing how many people were dependable Democratic voters, how many were likely Democratic voters but needed a nudge, how many were frequent voters but not committed, and how many were core Republican voters—the kind of data strategists use in planning ad buys and other tactics. The Journal reviewed these documents as well as Democratic voter analyses also sent to Mr. Nevins about congressional districts in Kentucky, Pennsylvania, Texas, Virginia and West Virginia.